The basic structural rods in these polyhedral shapes are made of 16 DNA double helices joined together, with struts of two DNA double helices. The largest structure, the hexagonal prism, is around 60 megadaltons. They are visible in this video because fluorescent probes transiently bind sequences at the vertices. The 1966 movie Fantastic Voyage presented a vision of the future that includes tiny machines gliding through the body and repairing injuries. Almost 50 years later, scientists are figuring out how to form building blocks for such machines from DNA. "Currently DNA self-assembly is perhaps one of the most promising methods for making those nanoscale machines," says co-author Yonggang Ke, PhD, who recently joined the Wallace H. Coulter Department of Biomedical Engineering at Georgia Tech and Emory University as assistant professor. The research team was led by Peng Yin, PhD at Harvard’s Wyss Institute for Biologically Inspired Engineering. Working with the same team, Ke was also first author on a 2012 paper in Science describing "DNA bricks" resembling LEGO® blocks. 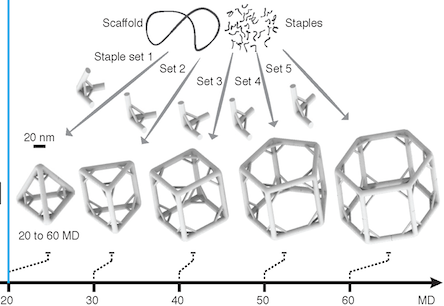 In the current paper, the shapes are made up of strut-reinforced tripods, which assemble themselves from individual DNA strands in a process called "DNA origami." Already, at 5 megadaltons, each tripod is more massive than the largest known single protein (titin, involved in muscle contraction) and more massive than a ribosome, one of the cellular factories in which proteins are made. The tripods in turn can form prism-like structures, 100 nanometers on each side, that begin to approach the size of cellular organelles such as mitochondria. The prism structures are still too small to see with light microscopes. Because electron microscopy requires objects to be dried and flattened, the researchers used a fluorescence-based imaging technique called "DNA PAINT" to visualize the jungle-gym-like structures in solution. DNA is not necessarily the most durable material for building a tiny machine. It is vulnerable to chemical attack, and enzymes inside the body readily chew up DNA, especially exposed ends. However, DNA presents some advantages: it’s easy (and cheap) to synthesize in the laboratory, and DNA base-pairing is selective. In fact, says Ke, these intricate structures assemble themselves: put all the components together in one tube, and all the DNA sequences that are supposed to pair up find each other in solution. Each leg of the tripod is made of 16 DNA double helices, connected together in ways that constrain the structure and make it stiff. The tripods have "sticky ends" that are selective and can assemble into the larger pyramids or prism structures. Previous efforts to build polyhedral structures were like trying to make a jungle gym out of rope: they were too floppy and hard to assemble. To see the pyramid and prism structures, the research team used the "DNA-PAINT" technique, which uses fluorescent DNA probes that transiently bind to the DNA structures. This method enables visualization of structures that cannot be seen with a conventional light microscope. Why not simply make the DNA structures themselves fluorescent? Because shining strong light on such structures would quickly quench their fluorescence signal. The research was supported by the Office of Naval Research, the Army Research Office, the National Institutes of Health, the National Science Foundation, the JSR Corporation, and the Wyss Institute.